This last week has been quite interesting and I'm happy that some of the stuff on our table has become public. CCP Seagull released more of the things coming in Oceanas in a Dev Blog this week. I like this style of Dev Blog. I’ve seen it done back in 2007 and 2008 as expansions were released. They are good, dense recaps that one can hand out. There are a new type of burner mission coming. This is good but they are still locked inside of the level four mission pool. 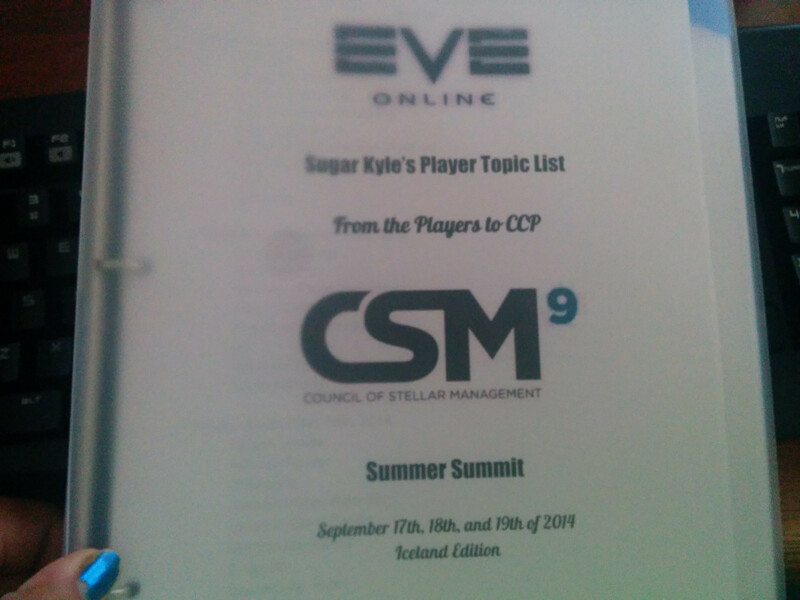 The desire for burner agents and levels 1-3 burner missions has been shared with CCP by both the CSM and the player base. The first steps of metacide (module rebalancing) are coming. Only a handful of items have been released so far. This will be a game changer because everything we know about why we fit things changes with each pass. Yes, a full null sec revamp is in the future. CCP Fozzie released a Dev post touching on the gathering of information that has been happening. I've been biting my tongue whenever someone asked if CCP is even thinking about null sec. Its nice to be able to say that yes, they are. Yes, the CSM is. It will be interesting to see how these sessions go. I don’t have a grand fix for null sec. Instead, I have spent my time worrying about where things often connected to null sec intersect low sec. That is mostly in the usage of Supers and Titans. The big CSM news is that Matias resigned and Asayanami was given the empty seat. CCP Leeloo made the announcement and then Matias decided to write formally to the player base and not just CCP in reference to his decision. He had his reasons for running and he found out during the first month that the demands of the CSM seat would not work with his schedule. We hit the ground running. Kronos was launching just a month after our term started and the six week cycles have had us in constant motion. Every CSM has had members who went AFK for their term. I am glad that Matias realized that he’d not be able to be active in the position and to resign instead of just holding the seat. The decision to promote someone to the seat was a good one. We could have continued to be a thirteen member CSM. Not removing an inactive member is also important. The players do vote that person into the seat. While I’d like policies for the removal of people who are completely inactive, creating them will have to be done carefully. Who people cast their vote for matters. Even if it means they cast their votes for people who they know will not be active or will be actively destructive. We can’t respect one and not the other even if one is unpalatable. At the same time it does not seem unreasonable for there to be a limit to complete inactivity. Asayanami was selected. Some people agree. Some disagree. Foo wrote a nice breakdown and explanation of the voting formulas and various options to elect a new member. There were congratulations and angry posts all in one. There was agreement that someone else should be selected and disagreement over how the selection took place. He got his NDA signed and back and access to the channels where he has been actively catching up on things. He made it to our bi-monthly meeting. Now it will be up to him to forge his path with the player base as it is up to each member to do so. Teams broke and went home a week early. This was fixed and CCP credited the time. It left a problem of that Teamless week where people lost a lot of ISK trying to compensate for a bug that put them in a very bad position. This has been brought to CCPs attention in an effort to do more than just have the time credited. I do not like this “exploit is not an exploit” confused nonsense with bumping Titans in POS shields out of POS shields. understood that. However, we didn’t want to just not have it as well and we made our decisions. We will try to have the next Town Hall before Eve Vegas in October. We’re looking into moving to Twitch for the live broadcasting for those who do not wish to connect to Mumble and still submit questions. I’ll have to dig into that when I return home and get that up and running. I completed my Summit project. I’ve tried to condense topics down into a few sentences and given myself room for notes. The main goal is to help me keep track of these great topics people bring to me and to get as many answered or thought about as I can. The questions range from UI features like drone control range, to camera speeds and off to duels and markets and contract questions or points. This next week I will be out of the office but in the office. Please prod CCP to get rid of Z-axis movement of scanning probes. It might be a nice concept for people with 3d headsets, but for the other 100% of the player base, using it is painful. Please do NOT get rid of Z-axis movement of scanning probes. Quite simply space is a 3-D environment and if you don't like that go walk around WoW. That's a nice and safe 2-D environment... mostly. But don't think most of us don't use all the axis when scanning... I know for a fact almost every wormholer I have every talked to about it does. Its not about getting rid of itnits aboutnnot clicking on whaynyou can't see. Photos or it didn't happen. The group shot around the table, the private schmoozing afterwards, all of it. And don't try and tell me that you didn't take pictures--I won't believe you. WE're not interested in this. We need to know how the wicked rave was that you wore that metallic blue nail polish to.